This outfit starts with a fun print dress. 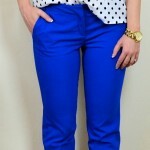 The print can be floral or geometric or striped or whatever pattern speaks to you. 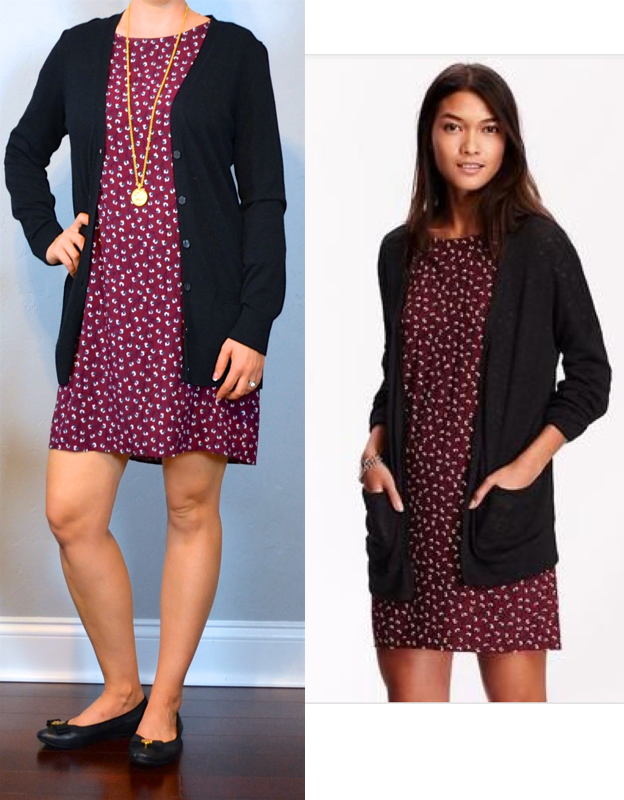 For me, my main object is to find dresses that have multiple colors in the print that coordinate with cardigans I already own. 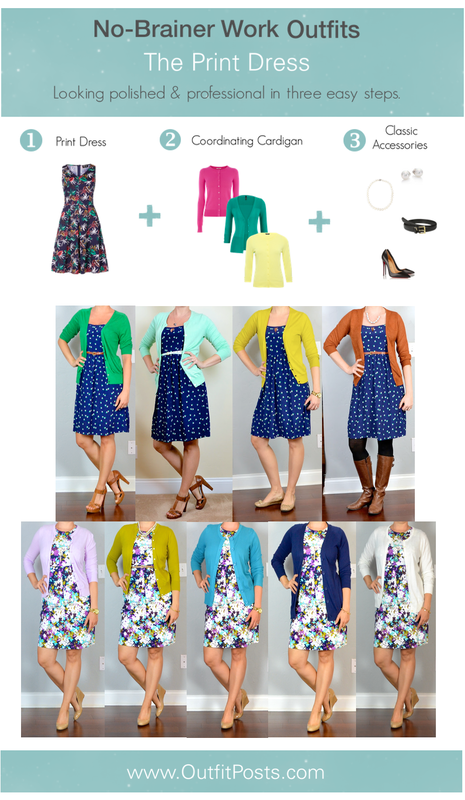 When I found the floral dress shown above and realized it had purple, green, teal, navy and white in the print – I was excited because I already had cardigans in every single one of those colors. 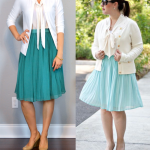 Next pick a cardigan (or jacket) in a color that you love. It can be any color that is found in the print or even one that just sort of ‘goes’ with the existing colors. I try to pick what I think is a fun color because the cardigan is pretty much the only interesting thing about this outfit. Finally add your most classic accessories. Neutral shoes like black pumps or black flats. A simple necklace or your favorite stud earrings. 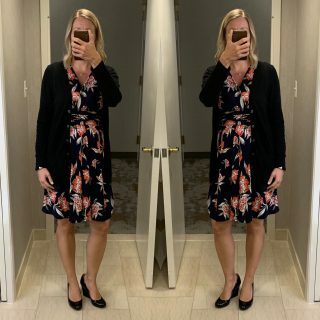 Do you have any advice for just starting to wear dresses/skirts to work? It may sound like a funny question, but I work in a male-dominated industry (automotive) and am the youngest person by far in the office, and thus am still a bit uncomfortable wearing outfits more revealing than the regular dress pants-dress shirt combo. Any thoughts? Love love love your work! Posts like these are so useful in the brain dead hour early in the morning lol! I like to primarily stick with what I feel comfortable in and then just stretch it a little bit beyond that. So maybe start with a black pencil skirt/black dress and black flats and see how you feel? Thanks! Glad you find them useful!